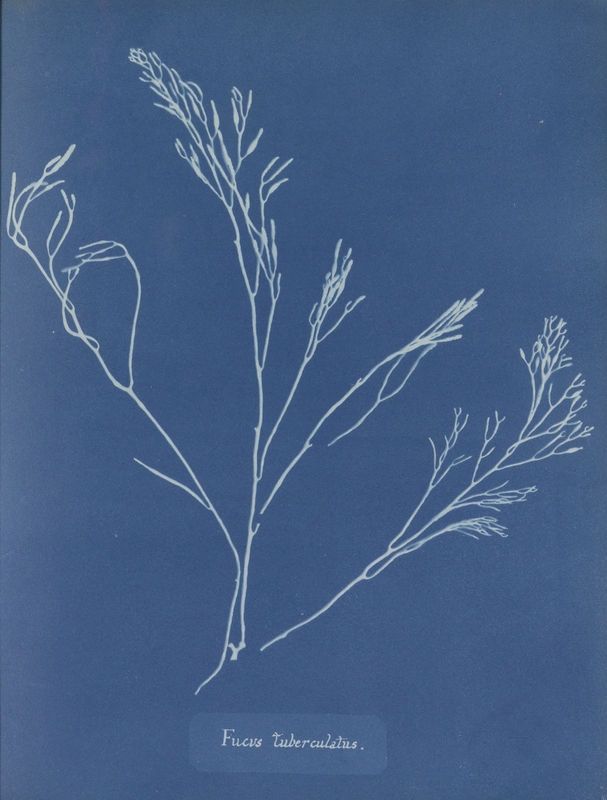 The Rijksmuseum has acquired an extremely rare copy of the first photographically illustrated book, a compendium of British algae created and privately published by botanist Anna Atkins. The museum bought the book from a private collector for €450,000 ($500,000) with funding from the lottery and family foundations. These were contact prints, technically photograms rather than photographs, made by placing the dried botanical specimen on cyanotype paper. The process was developed in 1842 by astronomer Sir John Herschel who used it as a tool to make quick copies of his notes and drawings (architects quickly followed suit, hence the blueprint). 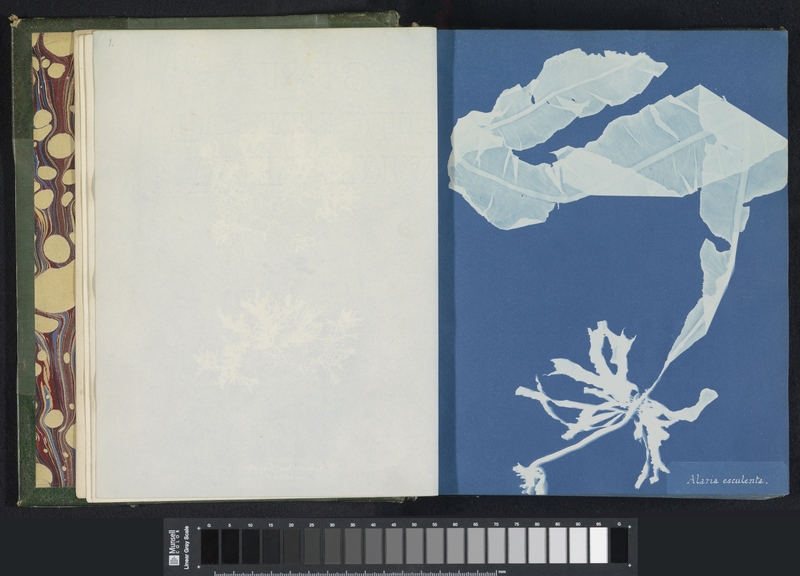 It was Anna Atkins, a personal friend of Sir John’s, who saw the potential of cyanotypes as scientifically accurate illustrations of botanical specimens. Born in Tunbridge, Kent, in 1799, Anna Atkins was raised by her father, John George Children, after her mother died when Anna was still a baby from the effects of childbirth. Children was an accomplished chemist, mineralogist and zoologist who worked as a librarian in the British Library, was made a Fellow of the Royal Society in 1807 and served as its Secretary in the 1820s and 30s. Under her father’s care, Anna received a rigorous scientific education that was extremely rare for girls of her time. She married in 1825, but continued to pursue her interests in the natural sciences, collecting and drying botanical specimens. Her collection of dried plants gained recognition in the scientific community for its depth and breadth. She gave some of her specimens to the Kew Gardens museum and became a member of the Botanical Society of London in 1839. She would ultimately gift her vast collection to the British Museum in 1865. She began to experiment with photography in 1841, buying a camera on the advice of William Henry Fox Talbot, an old family friend who in addition to being a mathematician and optician was the inventor of the salted paper and calotype processes. Atkins is often credited with being the first female photographer, although Constance Talbot, William’s wife, has a competing claim to the title. Neither’s photographs have survived, so there’s no way to adjudicate the dispute. As a young woman, Anna had laboured extensively to create 250 engravings to illustrate her father’s translation of Lamarck’s Genera of Shells (published anonymously in 1823). She was intrigued by the idea of a system that would reproduce plant specimens more precisely instead of relying on the artistic talent of the engraver. 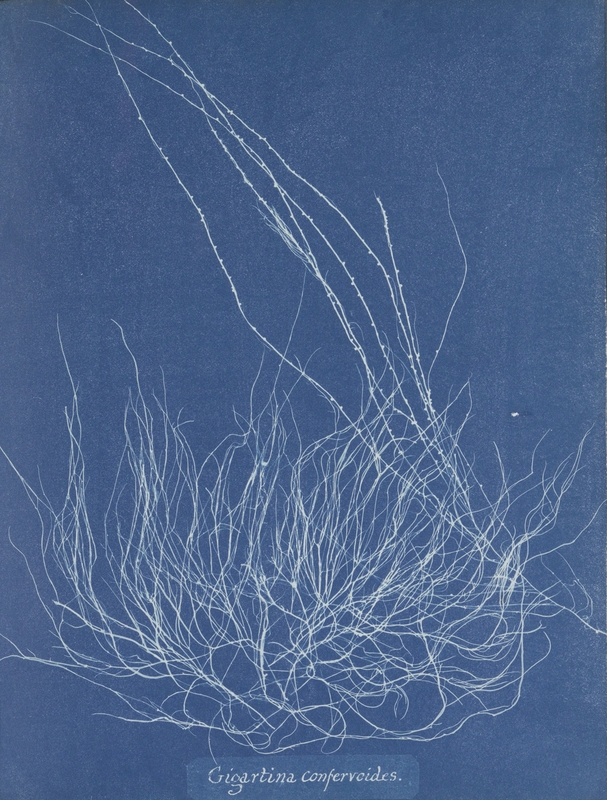 Twenty years after she produced engravings of shells for her father’s treatise, Anna Atkins had mastered Sir John Herschel’s cyanotype process and went to work documenting her collection of seaweed specimens. Between 1843 and 1853, she made photograms and published them in a series of handwritten volumes. 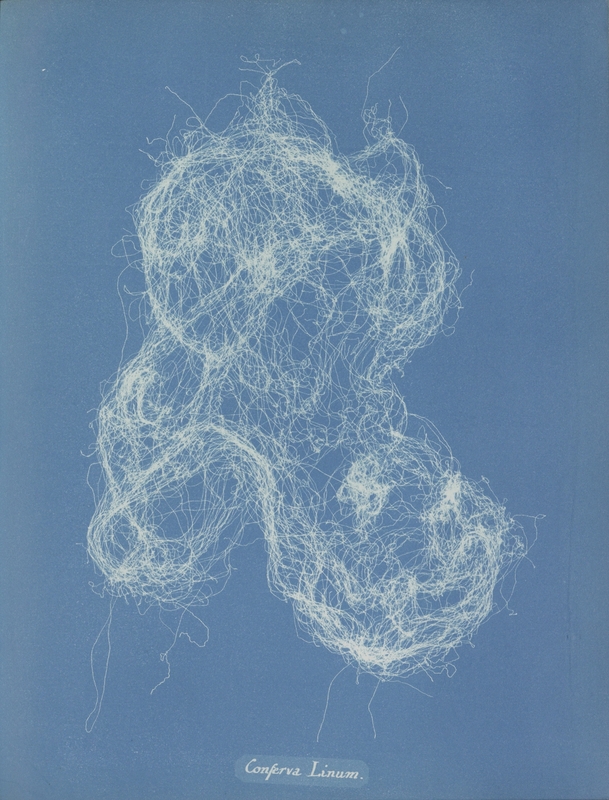 For the various editions, Atkins produced thousands of cyanotypes, or blueprints. In those days, this photographic technique was a relatively simple and inexpensive way of making contact prints. By using two ferric salts, and exposure to strong light, a Prussian blue colour is created. Nevertheless, this process took a great deal of time and effort. All the stages had to be performed by hand: light sensitising the paper, exposure, rinsing and drying. The prints could only be made when there was sufficient sunlight, which is one more reason why Atkins took 10 years to complete her work. During those 10 years, Atkins produced editions of different size and length. Today fewer than 20 are known to exist, many of them incomplete. The British Library has an extra-long edition (429 pages), which they have digitized so you can browse page by page. The Royal Society’s copy (389 plates on 403 pages) is believed to be the one which comes closest to Anna Atkins’ original plan for the book. 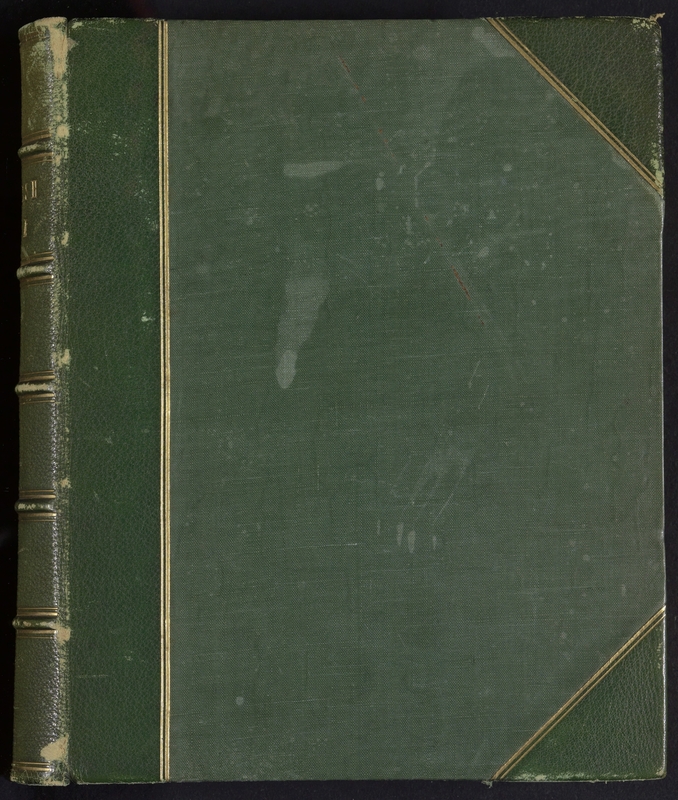 The version acquired by the Rijksmuseum is an especially fine edition because it contains 307 photograms, all in excellent condition, and because it retains its original 19th century binding. 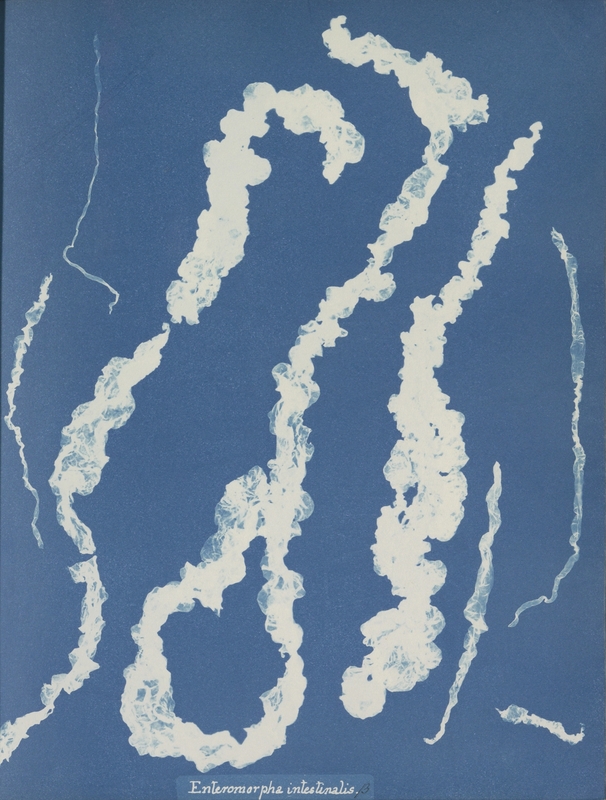 Photographs of British Algae: Cyanotype Impressions will go on display at the Rijksmuseum’s New Realities. Photography in the Nineteenth Century exhibition which runs from June 17th to September 17th of this year.